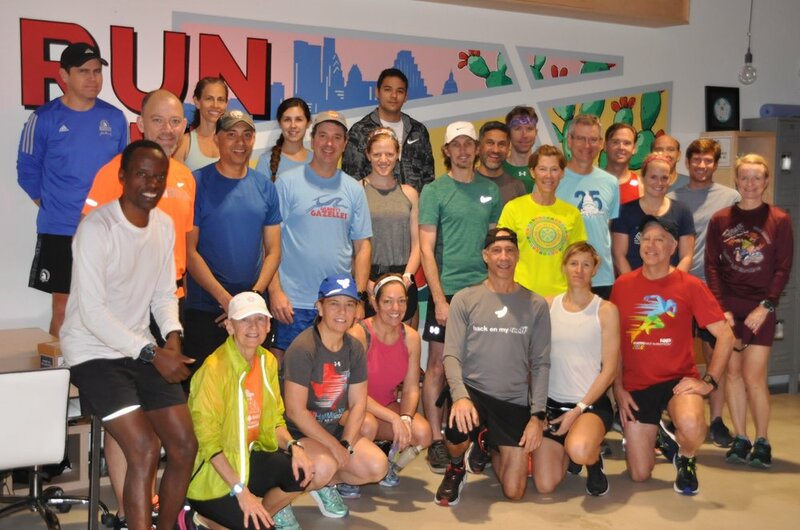 Good luck to everyone who has trained for our local Austin Marathon, Half Marathon or 5K! Race day is this Sunday, Feb. 17 and we're looking forward to seeing you all out there. We will meet at Gazelles HQ at 6:20 am for a Gazelles race-day group photo and then start walking to the starting line by 6:25 am. Stop by Gilbert's Gazelles' team tent at Congress and 5th street for the Finish Line Festival and post-race high fives and celebration! Show your Gazelles pride and help us have an awesome team showing on race day! We need at least 10 registered team members to be eligible for awards, including Fastest Team. Team members are eligible for individual age group awards and are able to place in the overall results. Team members must be registered with a team to be eligible for team awards. If we have 40 registered members by 3/19/2019 11:59 p.m. we qualify for a team tent area at the Finish Line Festival. Be sure to select Gilbert’s Gazelles as your team when you register! If you have already registered for the Cap10K, but didn't pick us as your team, you can manage your registration here. Belated congratulations to Ginger Stoker 1:48:22, 2nd place age group in the Ralston Creek Half Marathon in Arvada Colorado on 2/3/19. Jimmie McWilliams 10:04:38, 2nd place masters at the Rocky Raccoon 50 Mile trail run in Huntsville Texas. Thanks to our Physical Therapists! One of the many benefits of being a Gazelle is access to Physical Therapists (PTs). We have practitioners from two PT offices who volunteer to come to Gazelle during the week to provide free injury assessments. Under Texas State Law, PTs must have a physician’s referral in order to treat a patient, so these appointments only provide evaluation and advice. Next time you see our PTs for an assessment, remember to thank them for their time and advice! The Alamo Drafthouse and Austin Marathon have brought Skid Row Marathon to Austin. This film is about a criminal court judge who starts a running club on LA’s notorious skid row and begins training a motley group of addicts and criminals to run marathons. The Alamo is giving some screening proceeds to Community First! Village. This planned master community in Austin provides permanent, affordable housing to the chronically homeless and is currently fundraising to build a walking path on the property. You can also donate at checkout when you purchase movie tickets. What prompted you to join Gazelles and when did you join? Randy and I moved here in March 2018. I wasn't ready to join a club right away because I was dealing w/ a minor case of plantar fasciitis. Living across the street in Gables Park Tower, I would see runners gathering pre- and post-run every day. Everyone looked like they were having fun, so I did some research on Gilbert's Gazelles. It really was a no-brainer that I join the club, so I did in August 2018! I joined at the right time to start training for the Honolulu Marathon, which was Dec 9th. Which group do you run with? When I joined in August 2018, I ran with the Monday/Wednesday 5:30AM group and made some great friends! Now that I'm training for Boston, I'm a Tuesday/Thursday 5:30AM (occasionally 5:00AM!) girl, and continuing to make some cool friends! What's your favorite workout and why? The super fartlek is pretty fun. Great challenge at various speeds and since it happens towards the end of training, you really get to see how all of your hard work has made you stronger and faster! Believe it or not, I like Wilke hill repeats because you feel incredibly accomplished at the top of that damn hill AND when you're finally done w/ the workout. The Lollipop route is another decent challenge because of all the rollers. Track is always cool, but I absolutely dislike 1200s! How has Gazelles changed your running/life? I've belonged to one other running club back in MA. It does not even compare to the quality of Gilbert's Gazelles. I love the schedule and tailored training programs. I never feel like I can't do any of the workouts. There are some where I have to push myself a little harder, but I know I have a supportive Coach and running friends who are right there w/ me. Every single run, whether speed work, Mt. Bonnell, fartleks, recovery runs, they all make you feel good, smile, stay positive, and have fun. This club has been a welcome addition to my still somewhat new'ish life in ATX! What’s your favorite Gilbert-ism or best story about him? Each Gazelle featured in the Member Highlight has been selected randomly from our active member list. We welcome positive comments! You do not need to log in to comment or post a question, simply enter your name and comment as a guest. Questions or content requests/submissions? Email blog@gilbertsgazelles.com.